This week David Lax, co-author of 3-D Negotiation joins us. Often negotiators get stuck in the win-win or win-lose debate and focus on face-to-face tactics (the first and second dimensions). What sets the 3-D approach (TM) apart is its “third dimension”. 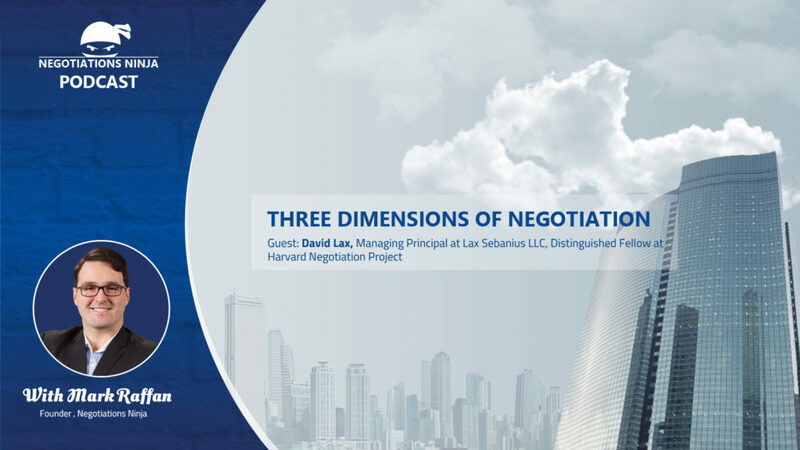 Before showing up at a negotiation, 3-D experts ensure that the right parties have been engaged, in the right sequence, to address the right interests, under the right expectations, and facing the right consequences of walking away if there is no deal. Often we think of our negotiations – especially if they’re multi-party – in sequential order but in fact that may not necessarily be the most appropriate use of our time. We’re discussing with David how to address this differently. For even more about 3-D Negotiation, check out 3-D Negotiation: Playing the Whole Game by David Lax and James K. Sebenius. Gary Noesner, The FBI’s first Chief Negotiator joins us to chat about his fantastic memoir Stalling for Time and shares incredible stories about the most famous hostage crises in U.S. history. From the Montana Freemen standoff, and to the D.C. sniper attacks, he offers a candid look at his years in the ranks of the Bureau. Gary was on the front lines of the 51-day standoff at Waco and the complex story is told in the miniseries Waco with Gary played by Michael Shannon. He offers a candid look back at his years as an innovator and a pioneer on the front lines. Gary Noesner retired from the FBI in 2003 following a 30 year career as an investigator, instructor, and negotiator. He was an FBI hostage negotiator for 23 years of his career, retiring as the Chief of the FBI’s Crisis Negotiation Unit, Critical Incident Response Group, the first person to hold that position. In that capacity he was heavily involved in numerous crisis incidents covering prison riots, right-wing militia standoffs, religious zealot sieges, terrorist embassy takeovers, airplane hijackings, and over 120 overseas kidnapping cases involving American citizens. He has appeared in numerous television documentaries about hostage negotiation, terrorism, and kidnapping produced by the History Channel, Nat Geo, WE, Discovery, TLC, A&E, CNN, CBS, BBC, American Heroes Network, and others. He has been interviewed in Time, Forbes, the Washington Post, the New York Times, and many other publications. Brexit. The USCMA. Tariffs. The world’s most powerful trading partners. We’re chatting about international trade with none other than the great Hampton Dowling. He supports businesses, organizations, and politicians with an insider’s view as they navigate their way through large, complex international trade deals. We’re chatting about when trade and politics collide, separating people from the problem, business leaders influencing trade, and what any negotiator has to be willing to give up. You’re in a situation that’s looking like it’s quickly turning into a crisis. Someone might harm themselves or someone else. What do you do? What does it take to control and resolve the crisis? Scott Tillema, speaker, police officer, and trained negotiator, shares his insights on the four pillars of how to bond with someone, why words matter, and long overdue conversations about mental health. We’ve all seen movies or TV shows showing hostage negotiators working to facilitate the safe release of hostages. Police negotiators are different in that they resolve crisis situations working with individuals who might be suicidal or is threatening harm to themselves or someone else. Gone are the days when the police can come in and flex their authority and say, “You’re going to do this because we’re the police and we say so”. Coming into a crisis situation with a collaborative mindset means we have to come to the situation with an open mind and a blank slate to start from. Both parties have to work together to reach the end goal and that means clearing your mind of biases or preconceptions. Everyone thinks they’re not biased. Of course we are – you can’t be human without being biased. The goal in any negotiation is understanding your biases and preconceptions and learn how to come to a negotiation and not let them influence the situation. To negotiate with someone in a crisis situation you first have to build a bond with them. How? Here are the four principles that work together to build a bond with people. Understanding. Our ability to listen versus talking. There’s always new information to uncover and new information constantly being revealed. We have to understand the problem first before we can start trying to resolve the crisis. Timing. Know when to deliver your message. When someone’s in crisis they’re very emotional and we have to work through that emotion to a place where they’re even willing to listen to us. Delivery. The old adage it’s not what you say it’s how you say it – so true! So many of us focus on preparing the content and stress over what we’re going to say, we forget to think about how we’re going to say it. Respect. We all understand how important respect is, but how do we teach it? Respect is about understanding emotion. When we have a better understanding of what triggers our own emotions we can start to think about what this person in crisis is going through, what needs to be attended to, can we give them the bond or support that they need? Hurtful words can stick with us for a lifetime. Encouraging words – at just the right time – can also stick with us for a lifetime. We already focus on what words we’re going to use, so Scott encourages us to dig deeper on the delivery of our words. Again, it comes back to understanding, timing, delivery and respect – a circle that goes around and around. Words build relationships and relationships deliver the two most important things you need in negotiations – information and options. We all know someone who is suicidal or has suicidal thoughts – even if we don’t know it. Take a minute and realize that today (at some point), you’re going to interact with someone who might be or is thinking about suicide. Even in policing the numbers are pretty clear – more officers kill themselves than are killed in the line of duty every year. First, have this conversation and be direct about it. Are you thinking of killing yourself? Have you considered suicide? Then follow up with understanding, that you’re listening, appreciate how they feel, and that you’ll always be there for them. There is help and many resources to teach us how to help someone in crisis. Remember, don’t ever hesitate to call 9-1-1 so a well-trained, compassionate police officer can help people through a crisis. We’re all in this together. Scott Tillema is a police officer with a passion for learning and sharing the principles of crisis and hostage negotiations. He has received hostage negotiation training from the FBI and is trained in business negotiation through the Harvard University Program on Negotiation. A prolific speaker his TedX talk – The Secrets of Hostage Negotiators is a must see for negotiators. This week we’re focusing on entrepreneurial negotiation and why entrepreneurs should care about developing negotiation skills. 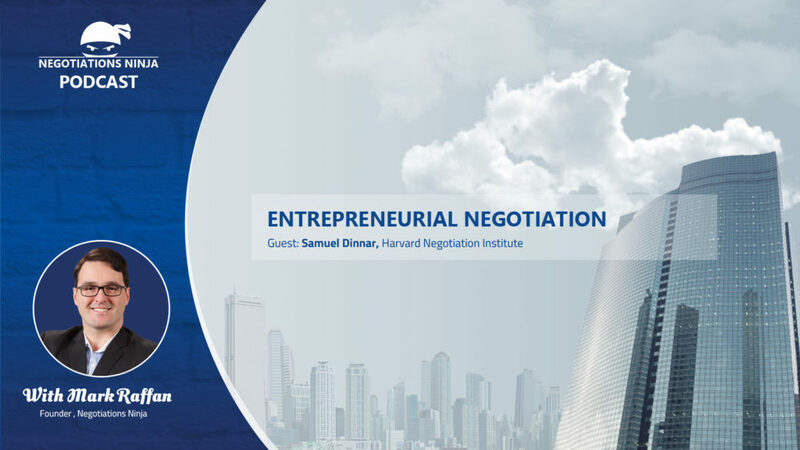 Author, speaker and teacher Samuel Dinnar joins us to discuss the eight common mistakes entrepreneurs make when they focus on scale and growth while neglecting developing their negotiation skills. How can entrepreneurs manage the relationships that determine their business’s success? Why is negotiating so important for entrepreneurs? Entrepreneurs are constantly negotiating for resources they don’t always control. They need someone to invest in their product or idea, or even work for them without a promise of reward. On the customer side, they need people to believe in a product that may not exist from a company who may not be around in six months. So negotiation skills are critical regardless of what stage an entrepreneur is at with their business – from idea stage to seed stage to growth stage to expansion stage. In his book (co-written with Larry Susskind), Entrepreneurial Negotiation: Understanding and Managing the Relationships That Determine Your Entrepreneurial Success, Dinnar and Susskind identify the eight most common negotiation mistakes that entrepreneurs make in addressing the complexity and relationships that are unique to startups and growing businesses. Entrepreneurs are self-centered. Because entrepreneurs are focused on their own interests (their pitch, their needs, their wants) they often fail to consider the needs, wants and priorities of their investors, customers, employees and partners. Entrepreneurs are overly optimistic and overconfident. Launching a business involves risk, uncertainty, disruption, and much more. Yet despite all the risk, entrepreneurs tend to be overly confident and strongly believe they will be successful (especially if they’ve overcome long odds in the past) even in the face of failure rate statistics. Entrepreneurs need to win – now. Negotiation professionals will tell you “winning” is reaching an agreement that is better than every no-agreement alternative. But, with entrepreneurs, sometimes beating an opponent (no matter what the cost) becomes the “win”. Entrepreneurs are too quick to compromise. Entrepreneurs are multitasking “doers” who need to get stuff done fast with limited resources. So they often feel like they have to decide quickly and move on so they accept simple compromises. Entrepreneurs work alone. Entrepreneurs are used to doing a lot with very little so they work alone in the startup phase and continue working alone as their business grows. The solo mindset becomes a problem when an entrepreneur overestimates what and how much they can do on their own, which can lead to lack of consultation, misreading unfamiliar signals, or emotional venting at the wrong time. Entrepreneurs haggle. Most entrepreneurs are convinced that their product, service or idea is unique – a unicorn – and therefore monetarily valuable. And while they may have had success convincing customers of that they tend to see the price of their product as their ultimate validation so they haggle on pricing to measure their success. Entrepreneurs rely too heavily on their intuition. Entrepreneurs are busy and don’t always have the time to prepare before a negotiation. So they decide to wing it and throw out all the proven theory and practice tips that negotiation professionals are experts at. When what worked before isn’t working this time, and a negotiation is going sideways, entrepreneurs tend to blame others and don’t learn from their mistakes. Entrepreneurs deny their emotions. Just like the rest of us, entrepreneurs are humans and humans have emotions. While claiming “it’s not personal” or “it’s just business”, entrepreneurs tend to overvalue power, leverage and control while overlooking the emotional needs every person brings to the table. Samuel Dinnar has more than 25 years of general management, strategic growth and operations team leadership with an exceptional track record of corporate growth, value-creating product management, multifaceted sales and hands-on development in hi-tech and aerospace, including international experience as an entrepreneur, strategy consultant, board member and investor – all , strengthened by experience in air force operations, servant-leadership and extensive deal making. As a Harvard Alumni, he gives back to his Alma mater as an instructor at the Harvard Negotiation Institute and is taking the Harvard programs global and teaching in Asia, London, Rome, Tel Aviv and Denmark.